Point Deviation means that the bus will be at “stops” or points at the scheduled times but may go off the route between stops to pick up passengers in nearby areas. Routes are designed to provide safe, convenient service to all passengers, including, those with disabilities. 1. Please board at one of the scheduled stops, or flagging down the driver along the route is permissible. (Refer to the schedule for times and bus stop locations.) The times listed are the earliest departure times. Please be ready at the time listed, but allow at least 10 minutes due to deviations and wheelchair lift use. 2. 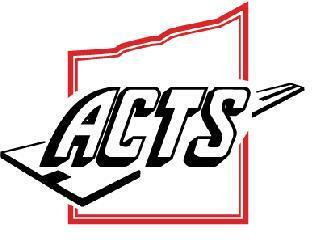 Call ACTS at (440) 992-4411 or toll free at (800) 445-4140 if you would like the bus to pick you up closer to your home. The bus cannot deviate more than two (2) blocks off the route. For transportation outside the Ashtabula Service Route area call ACTS to arrange a Demand Response (door-to-door) ride. Please note that advanced notice is required of at least one day. Same day request can be accommodated if space permits. North Park; at the corner of Main Avenue and West 44th St.
*Braille schedules are available upon request.